Luke Adams, a world-famous karaoke host, big-band singer, and actor whose voice has been featured on TV’s “Family Guy” and “The Cleveland Show” recently took charge of his health by amping up his exercise and losing 30 pounds in three months. Read on to see how Luke makes getting healthy pleasurable by doing the things that make him happy: Eating what’s delicious, working out in fun ways, and geeking out with the tech gadgets he loves. Like many of us, Luke Adams, pictured, found that his weight started creeping up as he got older. The multi-talented 49-year-old told Withings he just wasn’t paying attention, and before he knew it, he was carrying 270 pounds on his 5’11’’ frame. “I love food, and I’m from the south, where it’s all about food,” the Dallas-born performer said. 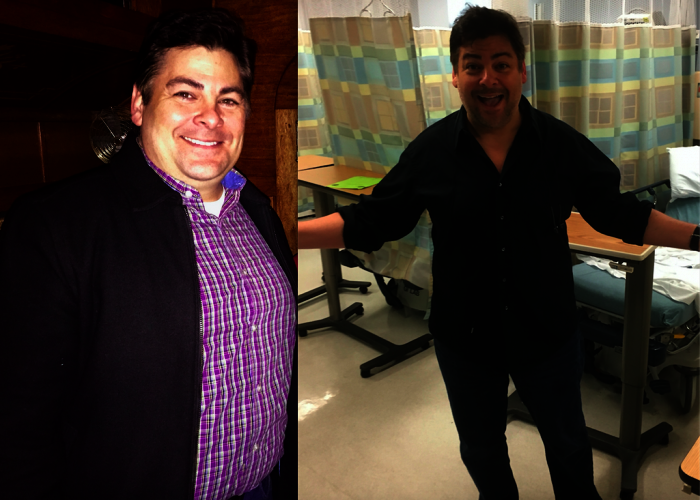 Adams was an early Withings scale adopter because, as he says, “I’m kind of a tech guy. I liked the idea of being able to monitor my weight, and I like how it’s all connected.” Adams tells us that he bought the scale for the cool factor. “It came out at the same time as the Apple HealthKit. I got the watch, and I think I saw the Withings scale for the first time on the Apple website. I bought mine at the Apple store.” At first, Adams said he might go several weeks without weighing. But things changed two years ago when he found out he had colon cancer. “I attribute Obamacare with saving my life. As a performer, I had to pay privately for health insurance, so I just didn’t have it for about 10 years. If they hadn’t passed this bill requiring it, I wouldn’t have gotten a colonoscopy.” When he went in for his first check-up in a decade, the doc found that his iron levels were surprisingly low and ordered a battery of tests. The colonoscopy revealed bleeding, which allowed them to catch the cancer early. “I was stage one, and there was no spreading, nothing in the lymph nodes.” They removed about a third of his colon, and no radiation or chemo was required. Luke is currently cancer-free, and more serious about his health than he’s ever been. It’s this joy in music that has kept Adams in his career for nearly three decades. “I get to sing every night, and meet good, fun people, like all the writers and voice-actors for Family Guy. I love music. I feel lucky that I get to have a job that lets me be around it.” He tells us that he records voice-overs in his home studio, and occasionally does musicals in regional theater, but hosting karaoke is his real love. And finally, since we don’t get to chat with a karaoke expert frequently, and we’re really into tools for success, we asked for his protips for choosing a song. We asked if there’s there a hard and fast Bonnie Tyler rule… or is Journey a no no? Thanks so much to Luke for his time! You can follow him on Twitter @luketadams. Want more inspiration? Check out more real-life Withings success stories. I'm a New York City-based novelist, cookbook writer, and ideation agent whose former jobs include stand-up comic, bookseller, and medical editor. Interests include nutrition, pop psychology, British culture, and dogs. My very favorite thing is reading.